There are times we like to study things that we don't have a textbook for. We use living books, encyclopedias, and trips to the library. Sometimes we write papers, keep a notebook, or create a lapbook to record what we have learned. I'll admit that once in awhile I don't want to spend a lot of time figuring out what we should do. Recently I have been using worksheets and tests from the Pro Plan available at HelpTeaching.com. HelpTeaching.com offers K-12 printable and online tests, activities, lessons, and games. They offer a limited free Membership, the Pro Plan for teachers and parents, and a Group Pro for businesses and schools. I have plenty of resources for the lower grades, so I wanted to see what they had to offer my high school student. I could find what I was looking for by browsing by grade level or subject. Amber is working on some ninth grade subjects and some tenth grade this year, so I started browsing by grade level. I was shocked by the tremendous amount of topics that are covered in this resource. Ninth and tenth grade both cover the Arts, English Language Arts, Math, Physical Education, Science, and Social Studies. Ninth grade also included Life Skills and Study Skills/Strategies. Under each subject are many topics. There is also a test making feature. In this section you can create your own tests and answer key. You can add your own question, browse all the available questions, or browse your own library of questions. You can edit your tests by moving the questions up and down or adding page breaks. The test can be scheduled, timed, and emailed to individual students or classes and can be saved as a PDF. Self-directed lessons are also available for high school. After a short introduction there are videos and links to online resources to help the student. There are questions to answer before the lesson and worksheets and tests for after the lesson.The links are to pages with more information about the topic. A game generator can also be used to create Bingo Cards, Word Bingo Cards, and Word Searches. Any word or number can be added to generate games to cover any topic the kids are studying. I wanted to get a good feel for high school resources, so I chose several different lessons, worksheets and tests for Amber. While I was browsing it was very easy to print the worksheets right away, save them to My Content to find later, or save them on my computer as a PDF. She is about to get her learners permit to drive, so I was thrilled when I found questions to create a Road Safety test. She also loves critical thinking, so I found her a worksheet with Logic Statements. Another one of her favorites was Analyzing a Eulogy. HelpTeaching.com is a great resource to have no matter where your kids go to school or what grade they are in. 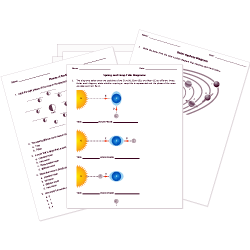 Generating tests and worksheets is very easy and there are plenty of topics available for the whole family.